As a digital agency we work on a lot of different projects. We are active users of Teamleader’s CRM, a tool we also use for its time registration services to make sure we keep track of all the hours spent on tasks. The timesheets give us valuable insights in workflow and productivity but also make it possible to get a grip on the expenses we make. Managing our Teamleader timesheets accurately felt like a struggle. We had to remind ourselves to keep up with them every single day. A solution was needed to solve this inefficient process. We started working on the idea of an application that lets you easily track time spent on projects and named it Teamtracker. As Teamtracker is one of our start-ups, we've created its entire business strategy, revenue model and identity. The desktop application is an integration particularly for Teamleader users and lets you log hours, calculate breaks and easily switch between projects by means of a timer. Users can now manage timesheets directly from their screen, without having to log in to Teamleader’s CRM. 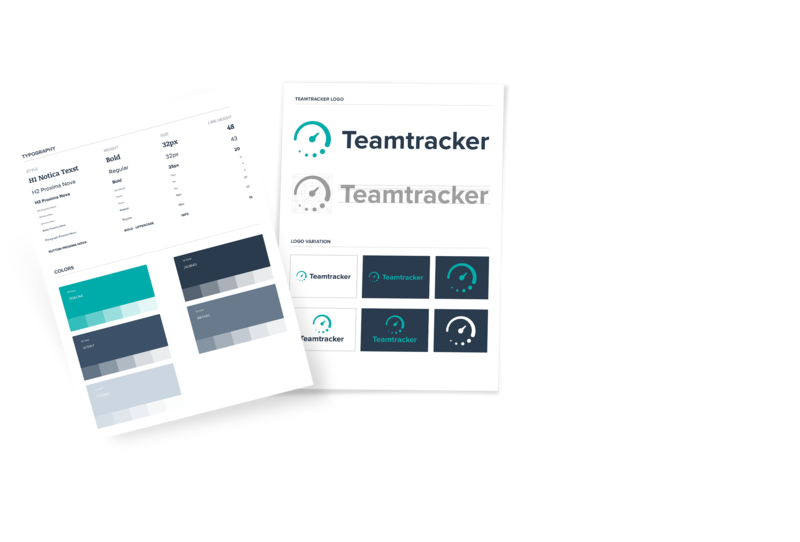 With the concept of Teamtracker being shaped, our team of strategists and designers created a brand identity that flawlessly fits the purpose of the tool. The logo, font and brand colors are created from scratch and used to deliver the Teamtracker experience and message. After shaping Teamtracker's identity we started on several creative sessions. Our buyer persona’s were given a face, we formed a buyer and customer journey and decided to give content marketing a spin by brainstorming about how to translate the story of Teamtracker. We are now creating content that affects all touch points in the journey, set KPI's to monitor efforts from our digital strategy and make informed adjustments. All information was bundled and shaped into a digital strategy magazine customly created and designed for Teamtracker. Our design team branded the complete identity of Teamtracker. This was afterwards translated into the entire style of the brand; from designs for the websites and its dashboard to the desktop application and even promotional materials. Finishing the designs led to the release of a landing page, which served for pre-subscriptions to the tool. After the launch of Teamtracker in May 2018 we replaced this one pager with the brand new website. Teamtracker is the first official desktop application for Windows and MacOs we developed. We created an update system that pushes our application updates directly to the Teamtracker users. It is integrated in such a way that bugs are solved as quickly as possible. The entire user base receives a new version of the app completely ready to launch in just 15 minutes! We developed a website not only to promote the tool. It also gives access to the accounts dashboard and is a way for the assigned administrator of an organisation’s Teamtracker account to manage its account, including the subscription plan and its users. Teamleader was closely involved during the entire development process, as we had to setup a connection with their API. This way we are able to sync data from the Teamtracker app directly to Teamleader's CRM dashboard. Our team created a short animation of the tool and complete motion to further display the functionalities of the application. It is now being used on Teamleader’s marketplace for integrations and serves us during Work Smarter events, organised by Teamleader, all across Europe. How can we improve your digital game plan?